On February 3, 1945, American forces entered the outskirts of Manila, capital of the Philippines, beginning the Battle of Manila, a ferocious and destructive urban battle against the Japanese that would leave Manila the second-hardest hit Allied capital (following Warsaw) of World War II. As part of his campaign to retake the Philippines from the Japanese (who had captured it from the Americans in 1942), General Douglas MacArthur first invaded the island of Leyte and then moved on to the island of Luzon, the largest of the Philippine islands and home to the capital, Manila. American troops were able to rapidly advance to Manila, leading MacArthur to believe it would be a relatively easy fight. They entered the city limits on February 3, quickly liberating Allied (mostly American) POWs and civilians from their incarceration at the University of Santo Tomas and Bilibid Prison. However, Japanese forces dug in and put up a fierce fight in the city, forcing the Americans and their Filipino allies into a challenging urban battle, in which they fought block by block, building by building, and floor by floor, frequently hand-to-hand. 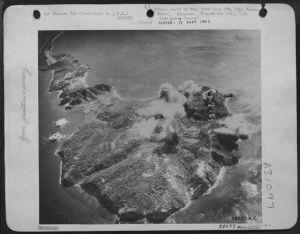 Eventually, over the course of the month, the Americans and Filipinos were able to capture much of the city as well as the island of Corregidor, in Manila Bay. However, Japanese remained within a walled portion of Manila, called Intramuros. MacArthur denied the use of air support out of concern for the civilian population, so the Americans used heavy artillery instead, pounding the walls until they were breached and then fighting to clear the area of Japanese. Finally, by March 3, Manila had fallen and MacArthur had turned the city over to the Filipino government. But the victory was not without great cost. In addition to the 1,000 Americans and 16,000 Japanese estimated to have been killed, it’s believed that at least 100,000 Filipino civilians were killed during the battle. 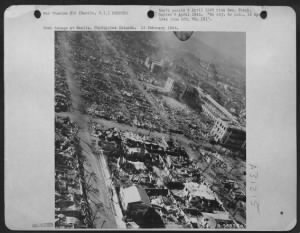 Many were brutally murdered by the Japanese, others were killed in fires that swept through portions of the city, and still more were killed as an unintended consequence of the American attack (particularly the artillery fire). In all, 80 percent of the southern residential district, 75 percent of factories, and all of the business district were destroyed, as were numerous governmental, educational, cultural, commercial, financial, and religious buildings. Despite the horrors of Manila, the battle for Luzon was not yet over. In fact, a portion of MacArthur’s forces would remain fighting in Luzon for the remainder of the war. Do you have any family member who fought in the Battle of Manila? Tell us about them. Or learn more about the battle by searching Fold3. My Uncle Captain Hardy Ulm was a doctor with a paratrooper medical unit. I got a couple of letters that he sent home. My mother was a Starr (from S.C.) and the family is intermarried with the “Latta” family that moved to Ark. May I ask where your families are from? You may call your local Veterans of Foreign Wars organization for contact information of numerous veterans organizations, whose members saw action during World War II in the Philippines if your grandfather Stanley C. Lada was with 11th Airborne as paratrooper. Remaining survivors usually come together to take sentimental journeys from time to time to the scenes of battles they have been thru. You should be able find out what organization your grandfather belongs. Best wishes! My Dad was also a paratrooper and medic in the 11th airborne. I have a newspaper article that indicated that he first saw action in the rain swept mountains of Leyte where they fought as infantrymen. The next action was the famous drive on Manila from the south where they made an amphibious landing in direct assault regiment and raced 65 miles to capture Nichols Field. As described in the article, my dad told me that when they liberated the American POWS from the prisons the men were not hurrying out as they wanted them to because they were trying to gather up every scrap they owned which was just little or nothing but obviously everything to the men in the prisons. My dad was poised to go into Japan and he said that if they would not have dropped the bomb, he would probably not come home alive. He lived to be 93 years old dying last year. He had an ulcer the rest of his life because of the food and living conditions he endured. I am so thankful that he survived and that we had so many wonderful years with him. We are so grateful for men like him that risked their lives to free our relatives! At Los Banos, they actually set fire to the barracks once they got them cleared so the prisoners would not run back in. They were so overjoyed they just wanted to celebrate and were in no hurry to get in the trucks. I will post the letter that my Uncle wrote later today shortly after they were liberated. It is a very moving letter. My father was a Paratrooper with the 11th Airborne also. Like your grandfather he never spoke about it. I know very little and would love to find more information. My grandfather was the same way. He never talked to anyone about it except my one aunt who just wanted to know. After a few times he finally told her that he did not have a choice and was not proud of it, but actually had to cut the heads off or shoot them. He really did not want to bring it up and was trying to forget what he had to do to protect themselves. I do have the knife and the case he used during this time. At this time when the heads were cut off the really did have to hang them out in the sun and I do not know if shrunken heads came from this or not. My name is Cleve and I work for the government. Almost everyday, I try to help veterans and the 1973 fire at the National Archives in St. Louis is a significant issue. I have found in some cases that there are ways to get around this. If you know the veteran’s unit number, you can specifically ask the National Archives & Records Administration (NARA) for Unit Records. They were stored in a different location from the individual records and most survived intact. You can only request searches of Unit records in 3 month increments so you need to have a good idea of the time frame you’re looking for (i.e., a one-year period would take four separate requests to complete). Also, there is a second NARA location in College Park, MD, that has different resources not available in St. Louis. Talk to your Congressperson’s office. If they have a competent staff experienced in veteran’s issues, they’ll be able to help you. Hi David. This sounds familiar what my grandfather was in. It was called Army/Air Force radio operator also a paratrooper. He had fought during time also. Before my grandmother passed away no one all these years we did not know that my grandmother got a VA Pension since he fought in the wars, but they actually retro the back pay when the info got collected. Until I got into the family history I did now that there was another location in Maryland. We were able to get the dog tags in St. Louis. It was a long time to gather the info but in the long run I guess it was worth it. Thing you for sharing. The family of my wife Charito was in Manila during that battle. According to Charito, some Japanese would warn the family to move to a different , safer block as certain blocks would be swept by the death squads. At any rate, civilians on the blocks to be swept had to keep moving and moving to avoid if possible, being killed. Those civilians moving had the “unwritten law”- any child crying in a group of moving civilians had to be smothered to death, as not to endanger the group. Tom Ladwig, a Naval aviator, flew Grumann Hellcat Nightfighters either during this battle or leading up to it. He said his job was to pretend to be Japanese Zero reinforcements coming in for a night landing. When the Japanese turned on the runway lights, he would bomb and strafe and call in other attacks. Any information would be welcome. My uncle Sgt Kenneth J. Kruzel was killed in Manila During a battle to take the airfield from the Japs.He is buried there at the Manila cemetary…He had earned his Purple Heart..He was in the 145th Infantry,,,37th Division..It was called the Buckeye Division from Ohio.He was killed July 31,1943…Im still seeking answers to how he died in battle.If anyone has any knowledge of the the battle or of Sgt,Kruzel,please help..
A Frank Klar died in Sto Tomas on 3 Nov, 1944. This is the only Klar listed for Sto Tomas. I do not see any Klar’s in Los Banos or Baguio Internment camp listed. Vasquez does not show up either, but they may have been repatriated before liberation. I do not find any McClures listed in the three camps. No Gonzales. No Monserrat. The roster documented in the Sto Tomas book reflects those in the camps at the time of liberation, for the exception of those who died during the time Sto Tomas was in operation. If you Google ‘Santo Tomas Concentration Camp Stratford House’ you will find a number of sources selling this book. About $120 USD but if you are like me with ancestors who survived this horrific place, well worth the money. The appendix of this book includes the complete roster of Sto Tomas, Los Banos, and Baguio camps. My dad, Harry N Madsen, was in the Signal Corps in the Philippines. Don’t have much detail. He was discharged in Nov 1945 and came home in early 1946 — took a while to get a place on a boat home. He received the Philippine Liberation Medal with 1 Bronze Star. All he would say about the war was that there might be no great moral reason why it should have been him instead of me, but it seemed important at the time. Well, and that the oysters in Australia on R & R were really good. My father was a Marine POW who was liberated from Bilibid prison during the battle of Manila. He often told us gruesome stories of how he was treated during his captivity. He told us they knew the Americans were getting close because of all the artillery fire. The night before they were liberated there was much concern because the Japanese officers had been told that under no circumstances were American prisoners to be liberated alive. He said the morning they were liberated the jap guards lined them all up along a wall and marched in with rifles. They were certain they were going to be executed. The commander told them their duty called them elsewhere and the pows should remain in the prison because there was fighting outside. Then they all turned and marched outside. Daddy said they went wild wit happiness. They raided all the food and ate so much they got sick. When they were discovered by the Americans they weren’t sure who they were because their uniforms had changed from when he was captured and the soldiers weren’t sure who the pows were because they were so malnourished. My father beach headed Leyte and then to Luzon before finally retaking Bataan and the entire Island of Luzon. My Dad was Battery E of the 139th Artillery, 38th Infantry Division. The Avengers of Bataan. He spoke little of this until much later in life. He passed at the age of 94 back in 2011. Of the times he spoke of it, he told me that if God sent him to hell when he died, that it couldn’t have been much worse than his time there. His one comment to me was it was war and the 38th Infantry Division had a motto. “Kill em and count em. A quote from the book Avengers of Bataan that was given to me from my Dad stated about the 38th Infantry Division, “It is a division of killers, pure and simple. Men who are reminded constantly that their on purpose in the present war is to kill Japanese soldiers and to kill them quickly, efficiently and by the gross lots. If they are proud, perhaps a little prouder than other divisions, they have a right to be.” Written by John Cashman IN8 war correspondent who later died in a bomber crash on Okinawa. I have the map that my Dad carried with him everyday that he fought on the island Luzon and the city of Bataan. I will cherish his memory and service to our country till the day that I die, then the book and map shall be handed down to my sons so that they can remember the price of war and the hero’s that lived it…..including my Dad. Ronald, my father fought in Luzon and Leyte Island during the war. I found it very interesting that your father and my father had the same last name and fought at the same place in WWII. If you would be interested in discussing this, please feel free to contact me. Lannie, I had a couple of uncle’s that also fought along side my Dad during the retaking of Bataan and Luzon, but none that a son named Lannie that I can remember. My Dad’s name was Lacy and was from Southern Indiana. Ronald, Thanks for the response. Just thought I’d mention my father fought at Leyte and Luzon and perhaps there might have been a connection. You just never know. Wow Bob, that is amazing to have someone that served with my Dad and my uncle. I looked my Dad’s book and sure enough under Battery C was your Uncles name. It is listed as Cline, Earl W. Box 123, Malinta, Ohio. I will try to photograph it along with the map and send it on to you at the address you provided. So many from the 139th Field Artillery were from South Indiana, Kentucky, and Southern Ohio with their field training taken place at Camp Shelby Mississippi where my Dad was an artillery instructor from 1942 through 1943 before their unit was shipped out for jungle training on the Island of Hawaii and then on to Leyte. Small world and our greatest generation has all but passed on now. But we can never let their memories die with them. That is great and amazing! Yes, Earl was from NW Ohio and was drafted 1/1942. We have a copy of his DD214, but, his 201 file was burned in the the fire in St. Louis. The family will really appreciate having this information. What is the name of your dad’s book or is it the unit history? Also, let me know if you want an image of the linen handkerchief? We will be meeting with one of Earl’s sons in March, so I will try to review some of the items he brought home to see if they are worth taking a picture of. My father,the late Loren James Cofta,was a Petty Officer aboard the USS Wiseman. It was DE-667 and had it’s midship armaments removed and replaced by electric power generating equipment. It arrived in Manila on or about 2/3/1945 and became the primary “Electric Company” for all of the city for the next 5 months. It became a target of the Japanese soldiers remaining at large in Manila. It was not uncommon for the Shore Patrols to catch Imperial Army soldiers trying to board and sabotage the Ship. I hope this helps. My Father Joseph David Howard Sr. Was on the Biloxi the Biloxi was in every major battle in the South Pacific and was nicknamed The Double lucky because they did not lose even one man in battle but unfortunately one sailor did fall over in a typhoon. In 2008 a home health care nurse (a Filipino lady) came to do a home healthcare check on my Dad. She saw his World War II ball cap. And ask about it I told her he was in the South Pacific in World War II she got very excited and emotional and hugged daddy saying you save me you save me. Then we all got a little emotional I think this is why they’re referred to as the greatest generation. One interesting thing my dads discharge papers indicate that he was paid a total of $300.00 plus $147.50 travel pay For two years…nine months…and 27 days of military service of which approx. 1 year and 7 months went down in the Asian Pacific…this puts a perspective on the dedication our military ancestors had to the United States of America and the freedom it stood for. The decimal place is different today but we must realize the price paid by both life and toil for the privileges we enjoy today. I for one am thankful…. I have a 8mm movie taken by my father, Lt (jg) Jack Ronald who arived in Manila some time following the attack. He is standing on a hill and behind him there is nothing but destruction and shelled buildings. Very moving scenes. My grandfather was liberated as a Filipino POW who fought w/ the US Army as part of the Philippine Army. His first wife and 3 children with tortured and killed during the war. The japanese would take the babies and throw them from the 2nd floor of some homes into a band of japanese soldiers waiting below with fixed bayonets to catch them….absolutely evil times. My mother, Marion Lapham, her husband and two young children were interred in Santo Tomas University prison camp after the Bataan Death March. Four long years passed until the Battle for Manila raged to release them. The youngest happened to be outside in Manila’s proper with a Dr’s family for almost a full year prior to this time frame. (But that’s a different story) And they stayed alive by running from block to block as explained by a couple of posts above. My mom was a small person, about 5’5 but she weighed 87 lbs. by the time she was released and that was after a pregnancy. My father Robert Brown was an Army MP. He entered Manila right after the fighting ended to clean up. He told my Mother it was a very gruesome scene, especially the slaughter of the villagers by the Japs. He took pictures, my Mother said they were horrible. She destroyed the photos several years after my father died. Thank you to all who served our Great Nation, and thank you to the families. Amazing how the greatest generation spoke so little about their heroism. We are so blessed to have had them. Thank you all for sharing your stories. They renew my faith and pride in our Country, at time when, what they fought for seems to be under attack by our sitting President. Red Blue Brown Black & White Unite stand up & Fight so American Democracy doesn’t go quietly into the Night! When I called and wrote to VA I was told that there was a fire and they had NO INFORMATION. What organization might be able to help me find out more information? My uncle was a member of the 151st Infantry 38th Division Company C, he was a Staff Sergeant. He was killed when his company went back into the Phillippines. He died on Luzon on Feb.8th, 1945 and is currently buried at Manila. I have several items that have been handed down to me from my mom. My uncle’s name is Carl J. Tieteman and he received a purple heart for his service. In 1941, My great uncle was twelve years old and living in he Philippines where he was born. When the Japanese bombed Mindanao, his father enlisted himself and his son, my great uncle, in the Philippine army at Camp Overton because he thought they would be safer in the military and the American army would not take his son because he was too young. They spent about 6 weeks with Col. Veesy dodging the Japanese. Ultimately, they were cornered and taken prisoner and put in concentration camps for the remainder of the war. In 1945, all the prisoners were taken to Manilla to be shipped off or shot. My uncle was present when one of the first American tanks came into Bilibid in the center of Manila. He saw when the first tank shot down the commmander of the prison, Lt. Abiko. Then 8 more tanks pivoted to turn their fire on the building complex but my uncle and others stopped them because there were civilians in them. i have a great account of the war as experienced by this young man but it is too long to include here. My Dad, Howard P. Morse, was in the 536th Amphibian Tractor Battalion from 1943-1946. He was in battles in Leyte, PI, and Okinawa. We have a huge book on the exploits of these brave young men who maintained their morale and positive attitudes throughout the war. Howard was just a Texas country boy who had learned how to tie a necktie in the C.C.C. He learned how to shoot in the Big Thicket where he grew up. He was a successful businessman who passed away on January 22, 2017, at the age of 93. He did push ups and swam laps in good weather every day of his life until a month before he died. He still had the same positive attitude. My hero, my father who spoke very little of his time fighting in this war was George Albert Russell, 11th Airborne (Paratrooper) C-152nd Artillery Served from (Yrs 43-46). I know he was one of our soldiers who helped in the rescue in Manila and I believe it was American nuns. His unit never received there medals and the surviving members were invited back by then President Marco’s. I just found this wonderful site and am hoping to find some connection to others that might have served with him. He was from Clifton Heights, Pa.
One of the few stories he told other than being so hungry and dirty all the time was not having socks and boots that weren’t crusted with mud or filled with holes. I wish he has be able to tell me more. Sadly he was taken away from us shortly after he received medals in the late ’70’s, at the young age of 56. My father Algernon Chivers was also a paratrooper who jumped on Corregidor and Leste. He was part of the 503rd and 11th airborne. I am so lucky to still have my dad who is almost 96 years old. He never talked of the war when I was growing up. In the last 20 years or so he has shared his many stories. These men are apart of our greatest generation. I often hear people say they lost their dad and never found out their stories. I will have to ask my dad if any of the names mentioned are familiar to him. I don’t think any of us can imagine what these men went through as very young men. My dad was 18 when he signed up before the war began. We owe these men our freedom. My brother was 17 when he volunteer for the Navy Aircorp. His name was Gerald Bergstrom. He was a Radioman and Gunner stationed in the Philippines. He visited the Philippines just a few years ago before he died. The people there treated him like Royalty. Every where he went they thanked him for his service. After all these years they never forgot the American soldiers who liberated them from the Japanese. They furnished him with a car and driver and found all the places he remembered from the War (airstrips, etc.) and did everything they could to make his trip memorable. He told of a road by the camp where the Japanese would wait in the jungle to capture a soldier, then torture him within hearing distance of the camp so they could hear his screams. It was a long time before he would talk at all about the War. We owe him and all who served in WW2 our gratitude. I know the people of the Philippines will never forget.